The Republican who heads the U.S. Senate Foreign Relations Committee said on Monday that U.S. President Donald Trump's nominee for secretary of state, Mike Pompeo, will face tough questions on North Korea and Iran if he is to be confirmed in the role. "There are going to be some tough issues he's going to have to navigate, like Iran, like North Korea, numbers of things, and I'm planning to talk with him privately about those," Senator Bob Corker said ahead of a meeting with Pompeo, the current CIA director. Corker said the meeting was his "beginning assessment" of Trump loyalist Pompeo, who was a member of the U.S. House of Representatives before moving to the CIA. After the meeting, Corker said he had been "very, very impressed." 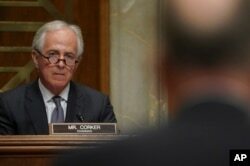 FILE - Chairman Sen. Bob Corker, R-Tenn., left, listens during a Senate Foreign Relations Committee hearingon Capitol Hill in Washington, Nov. 14, 2017. Corker said he could not predict whether the 21-member panel would back Pompeo at his nomination hearing, which could take place as soon as April 12. One of the committee's 11 Republicans, Senator Rand Paul, has already announced his opposition over issues including his concern that Pompeo would support war with Iran. Although Pompeo was backed by two-thirds of the Senate early last year when Trump nominated him to lead the CIA, his confirmation this time could be more complicated. Even if he is approved by the committee - or if Senate leaders bring his nomination up for a vote without its approval - Republicans hold only a 51-49 Senate majority in the 100-member chamber. Democrats have said it is too early to predict how they will vote on Pompeo before they meet with him or hold his hearing. Earlier on Monday, Pompeo met with outgoing Secretary of State Rex Tillerson at the State Department. It was the first meeting between Pompeo and Tillerson since Trump's decision to fire the former Exxon Mobil CEO last week following a series of rifts over policy on North Korea, Russia and Iran, a U.S. official said.